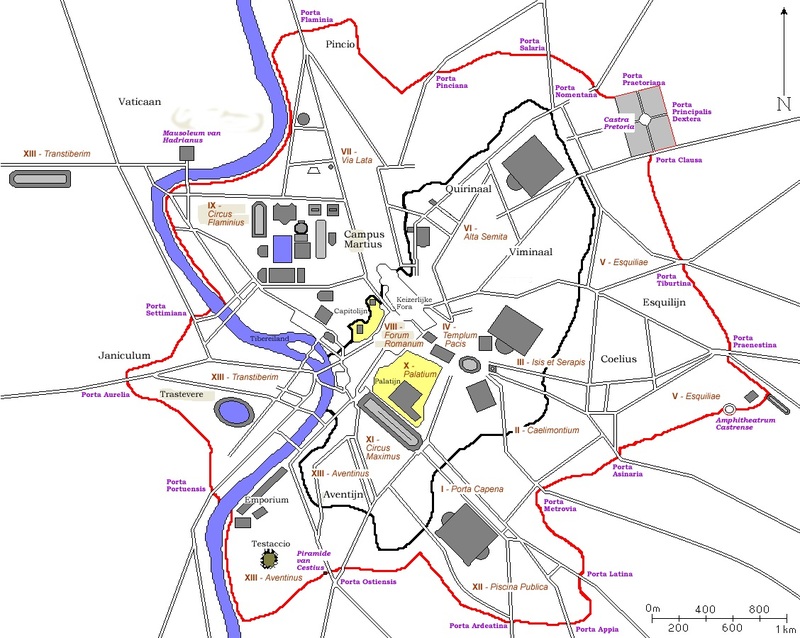 The Aurelian Wall (red wall on the map below) was a city wall built around Rome between 271 AD and 275 AD by Emperor Aurelius to replace the then-insufficient Servian Wall (black wall on the map below). By then, Rome had expanded much beyond its old Servian Wall, and although it had stood essentially unfortified for centuries because it was protected by its powerful armies, incursions by Germanic barbarians and Vandals (in 270 AD) and internal revolts forced Rome to rethink its defenses and construct the new, larger and taller wall. The wall enclosed all seven hills of Rome plus the Campus Martius and the Trastevere district across the Tiber River. The wall ran for a distance of 12 miles, surrounding an area of 5.3 square miles. It was 11 feet thick and 26 feet high, with a square tower every 97 feet. It was built from bricks, and featured a walkable passage on the inner side that fully protected soldiers on patrol. Aurelian died a few months before it was completed even though the construction only took 5 years. Part of the reason for the quick progress and low cost was incorporation of existing buildings into the new wall. Approximately 1/6 of the wall might have been composed of pre-existing structures. Places where you can see this still today are at the Pyramid of Cestius, and near Porta Maggiore where a section of the Aqua Claudia was used for the wall. An area inside the wall was cleared to enable the wall to be reinforced quickly in an emergency. The wall was effective against the hit-and-run raids which barbarians commonly used, but would probably not have been effective against a prolonged siege. A 4th century remodelling of the wall by Maxentius doubled its height to 52 feet and improved the watch-towers. In 401 AD, under Honorius, the walls and gates were improved by facing the brick gates with thick white stone, adding semicircular towers, walling up the second arch in two-arched gates, and by replacing gate doors on hinges into portcullises which dropped down from above. Despite these improvements, Rome fell to Alaric I, king of the Visigoths in 410 AD, whose army entered the city through Porta Salaria. Totila, king of the Ostrogoths destroyed 1/3 of the wall in 545 AD when he sacked Rome, entering the city through the Porta Asinaria. 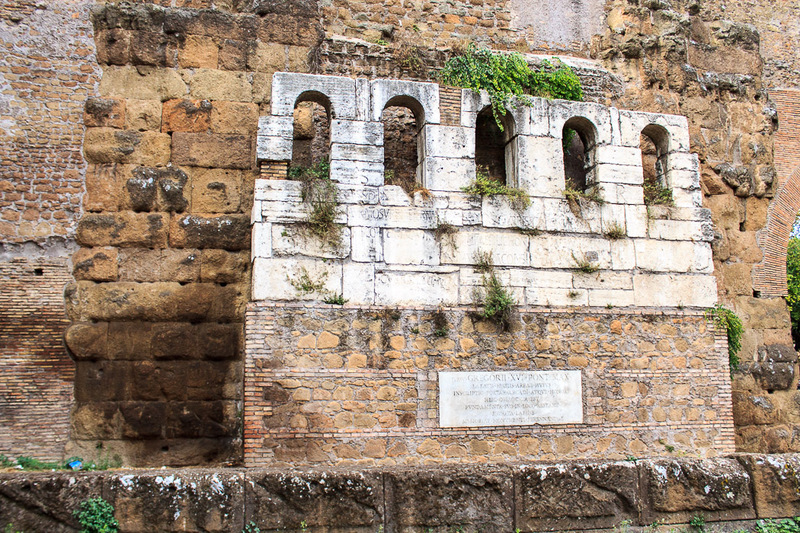 The wall was repaired and continued defending the city until 1870, when the army of King Victor Emmanuel II of the Kingdom of Italy breached the wall near Porta Pia and captured Rome. Today, several parts of the wall are still well-preserved, the best being along the northern edge from the Muro Torto (Villa Borghese) to Corso d'Italia to Castro Pretorio; along the eastern edge from Porta Maggiore to Porta San Giovanni; along the southern edge from Porta Metronia to Porta Ardeatina and from Porta Ostiense to the Tiber; and along the western edge near the Porta San Pancrazio on the Janiculum Hill. The Museo delle Mura near Porta San Sebastiano explains how the wall was built and defended. Most of the gates stand at their original sites but have gone through changes over the centuries, adapting their purpose according to the needs of the day. 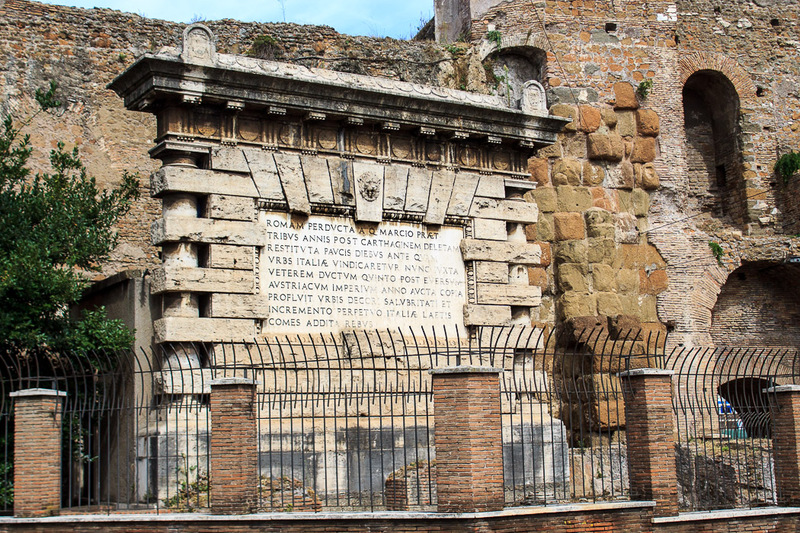 Porta Maggiore is one of the eastern gates in the Aurelian Wall of Rome. Two roads passed through it, the Via Prenestina, heading east, and the Via Labicana (now called Via Casilina) heading southeast. The gate was originally known as Porta Pernestina after one of those roads. Sometime after the Middle Ages the gate became known as Porta Maggiore, perhaps because the road that runs through the gate leads to Santa Maria Maggiore. It is a 32-foot-tall monumental double archway built of white travertine. The two archways are 46 feet tall and 21 feet wide. It was built next to the pre-existing Tomb of Eurysaces the Baker, which was built between 50 BC and 20 BC, and is still visible on the outside of the gate. Half of the aqueducts of ancient Rome came into the city at this point, and were distributed from here throughout the city. 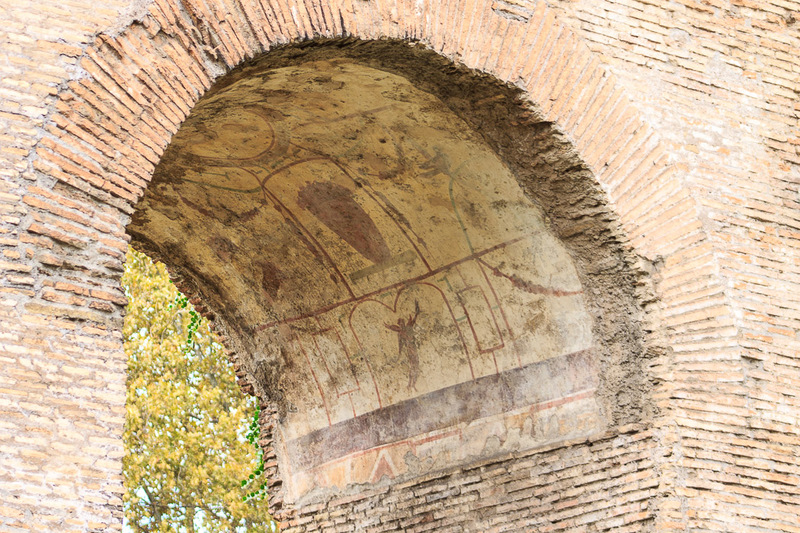 This is an easy site within the city at which you can gain an understanding of the ancient aqueducts, see a good long stretch of the Aurelian Wall, and see how the walls and aqueducts were incorporated into the architecture of the city. 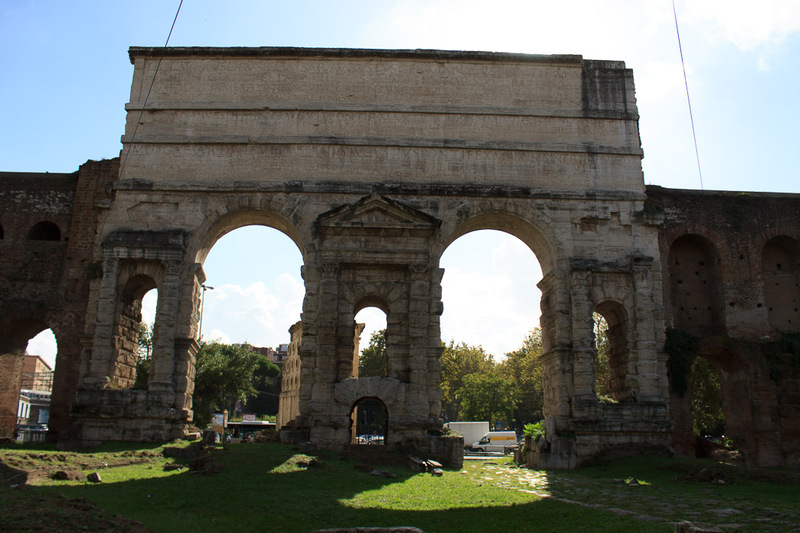 The original gate was built in 52 AD by Claudius and was built only to provide support for the Aqua Claudia and Anio Novus which crossed over Via Labicana and Via Praenestina. The two channels of these aqueducts, one above the other, are still visible today and can be seen in the attic when looking along the edge of the gate (3rd photo below). The lower channel was used for the Aqua Claudia and the upper channel carried the Aqua Anio Novus. 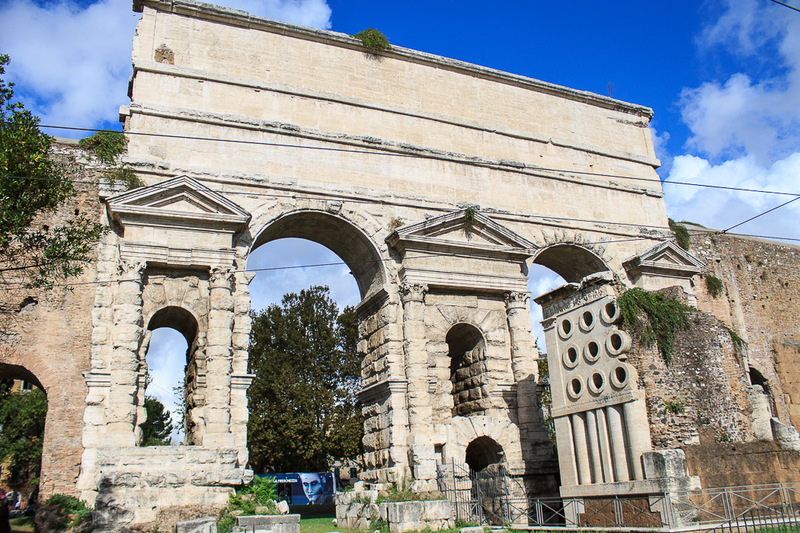 The columns holding up the architrave and aqueducts look eroded by time, but they were intentionally created this way during the 1st century as a design choice by Claudius. It was kind of modern art of the 1st century. One of the inscriptions above the gate states "[In AD 52] the Emperor Claudius [etc.] had the waters of the Claudia brought to Rome from the springs called Caeruleus and Curtius at the 45th milestone, and likewise the Anio Novus from the 62nd milestone, both at his own expense." Subsequently, Vespasian restored the aqueducts because another inscription on the gate states "[In AD 71] the Emperor Vespasian [etc.] restored to the city at his own expense the Curtian and Caerulean waters, which had been led to the city by the deified Claudius but had fallen into intermittent use and disrepair for nine years." Just 10 years later, the third inscription tells that "[In AD 81] the Emperor Titus [etc.] at his own expense, had the Curtian and Caerulean waters, introduced by the deified Claudius and afterwards repaired for the city by Titus's deified father Vespasian, restored with new structures, beginning from its source, after the aqueduct was ruined to its foundations from age." 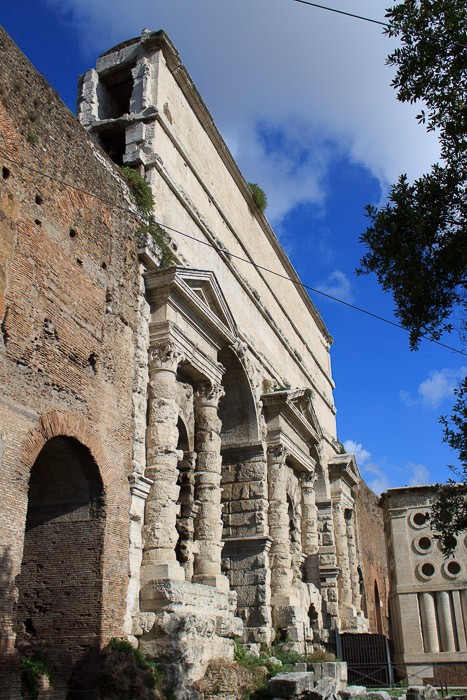 In 271 AD, emperor Aurelian incorportated the gate into the Aurelian Wall, turning it into a true entrance gate into the city, and reducing the size of the openings in the arches. This is a good example of how the Romans reused existing structures for a new purpose. Emperor Honorius added a guardhouse in 405 AD, which has since been moved to the left side of the gate when viewed from the outside (4th photo below, and photo at bottom of page). Cross under the aqueduct that runs perpendicular to the gate at the south end to view this guardhouse. Honorius also rebuilt the upper part of the gate, but when the original gate was subsequently restored, his modifications were mounted to the wall a slight distance away (5th and 7th photo below). The ceiling of the arch to the left of the gate (from the outside) is interesting. That arch is at the left edge of the 2nd and 3rd photos below, and a close-up of the ceiling is shown in the 6th photo below. It is decorated with third-style paintings. See all Porta Maggiore photos. The foundations of Honorius' guard house, from outside the south end of Piazza di Porta Maggiore. The Inscription reads "Presented in Rome by the praetor Quintus Marcio three years after the destruction of Carthage, then restored a couple of days before the city became the capital of Italy, was released, now in the fifth year after the fall of the Austrian empire, the supply of flows along the old channel to the splendor, health, and the perpetual growth of the city, a partner is committed to prosper the affairs of Italy." Remains of the upper part of Honorius' rebuild of the Porta Maggiore gate were moved here when the gate was restored. If you stand facing the inside of the Porta Maggiore (not the side with the Tomb of Eurysaces the Baker), you can see the Aqua Claudia and Aqua Anio Novus coming from the distance ahead of you and to your right. Peek through an archway and you'll see the aqueduct going off on the far side of the gate, slightly to the right. The water which reaches this point has flowed along that aqueduct for about 4 or 5 miles, from Aqueduct Park, where the Aqua Claudia is most impressive after having flowed quite a distance underground from its source. The water came from that distance, and made a sharp right turn to pass on top of the Porta Maggiore, then continued and turned gradually to the left to continue on along today's railroad tracks to the no-longer-extant settling tank near the Temple of Minerva Medici. At that sharp right turn, the Aqua Neroniano was built to split some water off the main flow of the Aqua Claudia. If you walk through the wall at this point and turn around to face back toward the now-hidden Porta Maggiore, you can see the view in the photo below. Aqua Nero (left of the guard house), and Aqua Claudia (right of the guard house), from outside the south end of Piazza di Porta Maggiore. The foundations of Honorius' guard house are between them. Porta Maggiore is behind these walls.